Not so long ago, the phone companies were corporate bullies with territorial monopolies, able to set whatever billing rates they pleased. With the advent of relatively new, Internet-based voice calling technologies, and the competition for customers that has resulted, today’s businesses have more options for phone service than ever before. Specifically, the rapid adoption of cloud phone services has forever changed the nature of office telephony. Phone service is now far more affordable, and it supports several new features that are extremely easy to manage, putting the power in the hands of the customer. Businesses using multiple lines, conference calls and voicemail systems once required special onsite switchboards and remote management at the hands of faceless phone companies. Today, the heavy equipment can remain with the phone service provider, and the entire phone system is managed in the cloud. Choosing a cloud-based phone provider, however, can be a challenge, as is the process of determining which features to select. Add to that concerns that you are getting a fair billing rate for the combination of services and features that your office needs and the procurement process can be exceptionally confusing. Atlantech hosts cloud pbx solutions for hundreds of businesses with thousands of telephone users across the metropolitan Washington, DC area. We are happy to consult with you as you move forward with choosing what kind of phone service will work best for your business. We do realize that our solutions may not be the final choice that your company makes, but we will be happy to review your most pressing concerns and questions to help you find the best fit. To start off, you can find Atlantech's cloud-based phone pricing here. Pricing starts as low as $12 per line. The parameters that contribute most to cost are things like, how many phone stations are necessary, and how many lines you need to operate simultaneously. Most of the premium features of business phone lines – call waiting, call forwarding, conference calling, video calling and the like – are commonly bundled into cloud-based phone service packages, although some of these may add to your monthly price. If that is the case, then reviewing the service options carefully, evaluating which ones you truly need, will help relegate your spending to the features that will provide the biggest game-changing value to your business operations. The costs of installing a cloud phone system can vary considerably – not only because of the service add-ons you choose, but also because of factors that are beyond your control, like the current wiring within your company’s building. An additional key factor in cloud-based pricing is where the people you call are based geographically. International long distance calls are charged by the minute based on the cost of the destination. The stringency levels of call security and encryption, as featured by your phone service provider, can also impact your costs. Security is always critical, but make sure to scale it according to your business needs. Bandwidth is another consideration when talking about costs. If your company has a heavy phone use, bandwidth may need to be addressed. This is especially true if your phone system is running on the same data stream as your broadband internet. You should discuss bandwidth issues with a professional who can make accurate estimations of bandwidth needs based on your business. As you shift phone systems, keep in mind that the best solution is one that will serve you well for several years to come. The more care you can devote to your decision now, the longer you will be able to rely on it into the future. Similarly, if you think through your options now and start with just the features, you know you need, you should be able to scale up as called for by your business growth. In the meantime, by opting for a cloud-based solution that is capable of growing with you but starting off with relatively only the must-have features, you may be able to save thousands of dollars. While 80% of organizations believe they deliver great customer service, only 8% of their customers would agree. How you interface with your clients can have a major impact on how they perceive your service. Even in the age of mobile apps and social media, your phone lines are still the most critical and common way to communicate with your customers. As a business, you need reliable, high-quality, and consistent phone service. You don't want a vendor that's difficult to deal with. While voice-over-IP (VoIP) telephony can help organizations unlock exceptional cost savings and quality, not all 'cloud-based' phone service providers are the same. With the right hosted voice provider, your customers won't be able to tell the difference between VoIP or a landline. In fact, a quality hosted voice service can achieve better quality service than landline technology. Cloud phone service can be great for your business. Your employees will appreciate the productivity gains of add-on features and built-in mobility. Your accountant will appreciate the cost savings. However, with current legislature and regulations, it takes minimal technology and licensing for an organization to offer cloud phone services. This means that the quality of the phone service, as well as customer service, can vary drastically from excellent to very poor. And many of the mass-marketed providers cut as many corners as possible to maximize revenue. For businesses, cutting corners on communication can be disastrous. 1. Do They Require "Bring Your Own Broadband?" Common VoIP providers are only in the business of IP-based telephony. This requires their customers to "bring their own broadband." This means your voice data packets for phone calls are transmitted across your internet service provider's network servers, across the internet to your phone provider. Your business calls are forced to share bandwidth with all of your internet provider's other data transmissions. If you're downloading a video or file, packet mix-ups during transmission are no big deal. The worst you might notice is a little delay. When you're dealing with a business voice call, out-of-order packets can cause jitter or stuttering, or in worst-case scenarios, chronic dropped calls. This can result in frustrated customers and employees. Bundling your hosted phone service and data connectivity through a single provider can allow you more oversight and control over your network. The right provider can ensure your voice packets receive appropriate priority over normal internet traffic. It can take your company twelve positive customer service experiences to make up for one negative one. Perhaps worst of all, companies only hear from an average of 4% of their dissatisfied customers. That means, if your clients feel frustrated by crackly-sounding or dropped calls, you may not even hear about it. With budget IP-based phone service, there can be a number of causes behind poor call quality. In addition, some internet providers limit the types of traffic that are permitted on their network, which can impact your call quality. Ultimately, true business-class hosted voice providers work hard behind-the-scenes to ensure exceptional call quality for their clients. This begins with an assessment of your bandwidth needs during the consulting phase and includes quality of service (QoS) tools post-implementation. Again, if your business-class hosted PBX is on the same quality network as your internet connectivity, the quality of audio can be superior to any other technology. Even in the digital age, 61% of customers prefer the phone as a channel for communications. Your organization can't function or maintain relationships if your phones are down for any period of time, especially on an ongoing basis. How do you avoid a cloud-based phone service provider who promises reliability, but just doesn't deliver on it? Inquire about provider redundancy: How does your provider build reliability into their business model for customers? Inquire about mobile failover: If your internet goes down, most budget VoIP services will also cease working. If your hosted voice provider offers automatic mobile switchover or failover, your calls will be received on mobile devices whenever your internet connection is down. Service-level agreements: The best cloud-based phone service providers offer service-level agreements to customers which may include a 99.999% uptime guarantee. Implementing a hosted PBX is not particularly complex. You will need a minimum of equipment and time to bring your new cloud-based phone service online. A worthwhile provider will assist customers with equipment selection and work proactively to ensure that bringing your service online is as simple as possible. For a deep dive into avoiding complex setup, we recommend SIP Trunking Compatibility Issues: What You Need to Know. If your administrative users lack basic capabilities or are faced with an incredibly difficult-to-use interface, it can result in hours wasted trying to navigate a poor user interface or countless calls to your provider. Some advertised add-on features aren't necessary for business. Many others are critical to ensure productivity and end user satisfaction. If your cloud-based phone service provider doesn't offer one or more of these features, it may result in spending more money purchasing third-party solutions in order to get the minimum service you need. It's amazing how much a company can save in communications by utilizing the offerings from their connectivity provider. Speaking to an expert can give you insight into how a unified communications strategy can save you a lot of time and money working with 3rd party providers. Almost every IT pro has met a company with poor post-sales support. During the sales and product evaluation process, you receive excellent support from knowledgeable representatives. 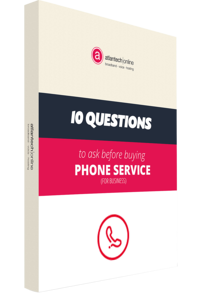 However, as soon as you've completed your purchase, you're faced with unreturned phone calls and poor support. If a phone service provider doesn't offer 24/7 expert customer support, that's definitely a red flag. If your phone system goes down outside business hours, you need a path to resolution, not a voicemail box. Checking vendor references can also help you verify quality of support. To learn more, check out 7 Characteristics of Great VoIP Customer Support and Service. An ethical phone service provider won't bury costly fees and penalties in the fine print of your customer contract. All of their fees should be listed on your quote or in Service Policies Guide so that you can see what you're paying for. Also, the bill should be presented in a format that is easy to read and does not require a third party to review on your behalf to ensure accuracy. At Atlantech, we're often asked about our phone service bills. What we have found is that most companies can't understand their phone bill. They have no idea what they pay for or if they are getting what they pay for. That's why we have one of the simplest billing statements anywhere. We want our customers to know where their money is going and what services they are receiving. VoIP phone service is mass-marketed on the internet because providers can literally offer cloud-based service to anyone, anywhere. But when it comes to business-quality, you have to move beyond the fancy packaging and find a provider that delivers the quality of service your business needs to thrive. At Atlantech, we have become a one-stop-shop for businesses in the Washington, D.C. area, providing direct fiber connectivity, hosted phone service, and data center services for our clients. Utilizing our fiber network for both internet and hosted phone service ensures your call quality is superior to any other option. We look forward to helping you take your company's phone service to a new level of reliability and quality. To learn more about our commitment to exceptional phone, data, and cloud services for business, click here to start a conversation today!